I’ve never really taken to the words expert fly fisherman. So, when people introduce me as such, I always roll my eyes a bit. I don’t doubt that I have as much or more fun while pursuing fish as anybody else, but I still walk away from the water sometimes with an icepack on my chin where those fish flat out busted me in the chops. Take last week for example. By the end of a couple days on the water I was searching for an expert so they could tell me how to catch a damned trout. I was fishing along Montana’s portion of the Rocky Mountain Front, an open plains region full of coulees and draws that host lots of deer, elk, antelope, gamebirds and even grizzly bears. The area also harbors some of the finest private lakes in the state and I had access to one with the reputation of being the best. It was built years ago and stocked with Kamloops rainbows three years ago, along with a few hundred brown trout. Some friends fished the lake earlier in October and spanked some monster ‘bows on nothing more technical than leeches and seal buggers. Nine-pounders, maybe 10, they crowed. Uh, I’m in. We hit the water last Thursday and about froze to death. I think the low that day was 16 degrees, registered in the morning of course, right when we launched an aluminum boat on the lake. I had high hopes and those were buoyed when a longtime family friend, Byron Vadset, banged a solid rainbow no more than a half-hour into the day. And then the drought began. We shivered through four or five hours of frozen face and fingers misery and only got a tap and a good grab. The good grab was courtesy of a big rainbow that may have gone seven pounds, but the fish threw the hook on it’s third or fourth jump. We trolled leeches. We trolled leeches followed by water boatmen beetles. We cast scuds and stripped them in off sinking lines. We marked fish in several spots, scads of them just outside the weedbeds. And we couldn’t buy a grab. We went to floating lines and indicators and chironomids and didn’t get a jingle. Came back two days later—after we’d thawed—and hoped that something had changed. This time we got calm conditions and I decided to walk the perimeter of the lake, working the insides of the weedbeds where I’d seen fish rolling a couple days prior. About a half-hour in I brought the leech off a weedbed and felt a good grab. I stuck the fish hard and he stayed on. A few minutes later I had a nice brown, maybe 20 inches long, sliding onto the shore. I snapped a couple quick shots and released that brown with new-found enthusiasm. But, Byron and a friend who hosted us weren’t touching fish and it wasn’t long before I realized that the bite hadn’t changed, that the fish were swimming around with lockjaw. And each time I heard Byron swear, I knew our chances were waning. Started really thinking about it and decided that those fish must have been heavily influenced by the lake turning over recently. There was plenty of algae in the water, but visibility was three feet or more. And we were right on top of the fish. They just wouldn’t eat. I open this for discussion: do you think they were filtering algae? Do you think they were influenced by the temperature change? I tried a green fly that looked like algae and couldn’t buy a strike. Stripped in various patterns ultra-slow and never got a tap. Let those chironomids just dangle in the drink and they never got a look. Hmm. Where’s LaFontaine when I need him? Where’s Denny Rickards right now? Should have revisited his great book, Fly Fishing Stillwaters for Trophy Trout, before I fished that lake on the Front. I tell you what. I have an invite to fish that lake and several others next fall. And I have an invite to visit when the damsels are coming off in late May and June. You know that I’m taking up those invites. I’ll figure out that lake yet. Here are a few shots from the past week. Hope you enjoy and I would love to hear comments on your theorries of why I couldn’t buy more than one brown trout. 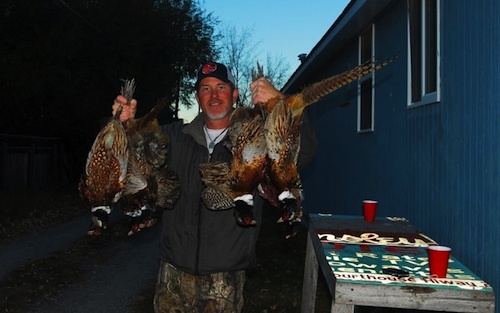 This entry was posted in Hunting, Montana, Northern Rockies and tagged Choteau, pheasants, Stillwaters. Bookmark the permalink.